Editor’s note: The author and photographer of this article are both women pursuing STEM degrees. The conference began, as most do in Hawai`i, with a “kipaipai.” This tradition is a way of welcoming newcomers and visitors into a space for learning. The chant and hula are a question, asking for permission to learn and to be accepted in this space. Some of the conference attendees, including those who were giving talks, were asked to be a part of this ceremony. The rest of the attendees who were early enough for the welcoming ceremony walked in to the musical chant and drumming. It was the first ever Women in STEM conference at UH Hilo, designed and executed completely by female students in STEM education. STEM is the acronym for the following fields, as defined by the National Science Foundation (NSF): “mathematics, natural sciences, engineering, computer and information sciences, and the social and behavioral sciences – psychology, economics, sociology, and political science.” The idea of STEM in education is to “prepare students to eventually solve not only current problems but also unimagined ones of the future,” according to the NSF. Thus is the underlying goal of the Women in STEM conference. “It started out with round table discussions with professors, and we decided to make it an all-day event,” said Karen Gallardo, a graduate student at UH Hilo in the Tropical Conservation Biology and Environmental Studies program. Gallardo, with the help of Megan Hillery of the Women’s Center, and Ashley Pugh, who is also in the TCBES program, started the planning for this event last semester. 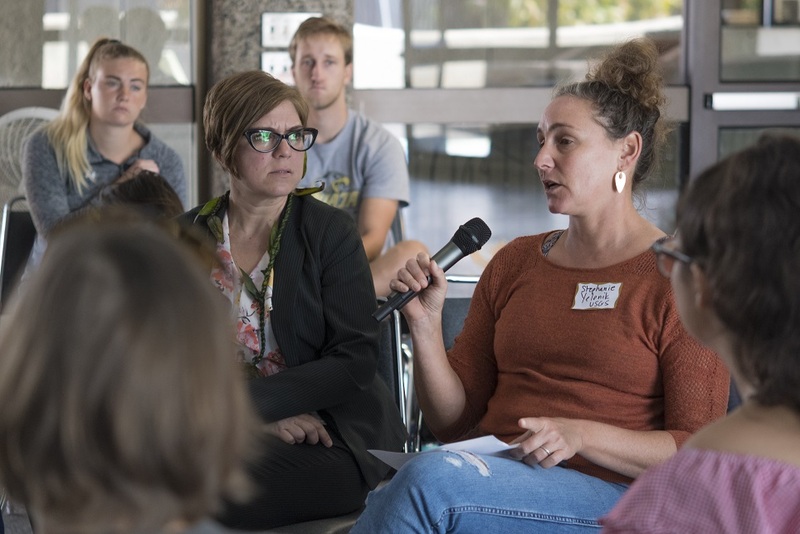 Their goal was to “connect like-minded women, acknowledge difficulties, and demonstrate resource availability,” according to Hillery; and with a schedule that was packed from 8:30 a.m. to 4:15 p.m., the conference did just that. The topics of the conference included everything from the latest studies of the wage gap in Hawai`i and abroad to sexual harassment and the resources available at UH. There was an overlying theme of the importance of mentorship in the STEM community and a panel on balancing work and family life. Overall, it highlighted some rather enlightening—and frankly, alarming—facts about women in STEM careers. Perhaps the best example of this is the research that was presented at the very beginning by Dr. Marina Karides, Department Chair and Professor of UHH’s Sociology Department. She explained that during a NSF funded experiment, she and her team found that the history of women in STEM in the UH system was largely unknown to senior staff and chancellors. Their statistics also found that 35 percent of the people employed in STEM careers at UH and University of Hawai`i Community Colleges are women. Dr. Karides pointed out that a neoliberal approach to education also becomes a problem for women. Neoliberalism is the idea that there should be profit at all costs and that efficiency must be valued over anything else. She explained that when she was in school, cutting courses or entire majors out of a curriculum would never even be considered. Today, not only is it a consideration, but it is often offered as a solution when classes or majors don’t have large turnouts of students or even good retention rates. The problem doesn’t stop there. Disregarding women becomes an oxymoron in this sense, according to Karides. There’s such a current emphasis on STEM education because of the idea that science is what progresses and develops society, and there are many studies that show how diverse leadership directly contributes to better and more productive companies. In this sense, disregarding women can actually hinder society’s scientific capabilities. But at the conference, the room was filled with people, especially women. Every single woman who gave a presentation or speech made it, despite these factors. They had to “dance backwards in high heels,” as the saying goes, yet at the Women in STEM Conference, there were speeches after panels after discussions given by doctors, mothers, graduate students, and mixes of all three varying in age and race with one common denominator: they were all women. Mentorship was a topic that came up again and again throughout the day. It’s also one of the solutions to ending the institutional barriers. “What mentorship can do—and this is the kind of cultural change that some sociologists talk about—empower women so that they can speak up themselves or build networks so that they don’t feel like they’re doing it alone,” said Dr. Karides. Another solution posed by Dr. Stotter was to “know your worth.” She explained how women should stop themselves from saying that they were “lucky” to make academic and professional accomplishments, when in fact they worked extremely hard to get there. Stotter also emphasized the importance of being prepared to negotiate wages in careers. “It does take a village,” she said. “But it also takes you.” In the end, the road to the solution really starts with grassroots efforts to make the problem more visible. “Even if it hasn’t happened to us, we know it’s a problem,” said Gallardo. Hillery commented that it’s events like the Women in STEM conference that show how important and serious this issue really is and how inspiring other women is the first step towards making changes for the future. Whether or not there will be a conference next year depends on funding for the event and if they are able to start the planning process early enough, but Dr. Karides said that this year’s conference was one of the best events she’s ever attended on campus.